Change of direction athletes come in all shapes and sizes, and from a myriad of different sports; there’s badminton, soccer, football, rugby, to name off a few. But recently at COGO Performance Development, I took on my first agility dog trainer and was absolutely impressed with the symbiotic relationship between dog and trainer! I didn’t realize that this subcultured sport if I may call it this, has been around for a very long time and at the world stage. My new client and I had met at a barbeque and spoke briefly about taking on some training with me but time had lapsed and it was shelved. Then at the end of last year, I sent out my usual email to a few tire kickers and lagging clients to either start up or come back and get their year started right. It was then that my agility dog trainer reached out. She had come back from a seminar held by a renowned European competitor and the class had been put through the wringer physically. She mentioned the number of mistakes she’d made and how her work capacity was lacking as well as her recovery! Elements that were important to her sport and reiterated by their host. She realized then and there it was time to reach out and see if I would take her on as a client as soon as she got home. I did and I also began my journey into the nuances of this sport so that I may better serve my new client. I was impressed at how precise these competitors had to be with their commands at fast speeds, change of directions as well as stop and go. Thanks to YouTube I was able to watch Cynosport games, Purina agility challenge as well as Crufts agility championships to name off a few. After a couple of hours, I sat back and realized that this is a sport I could definitely help. 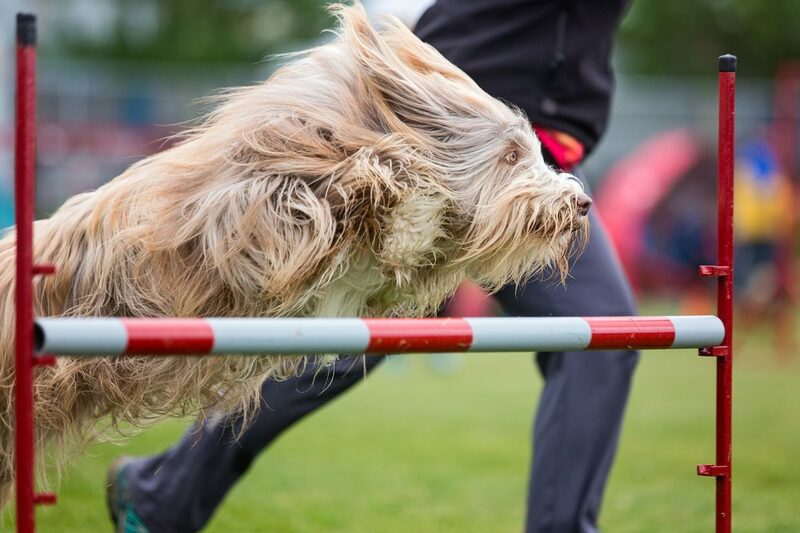 I saw potential in the individuals and amazing athleticism in their dogs. The reality is that as the sport grows we’ll see the same thing we saw with Curling or Golf. Where once existed out of shape beer drinking/smoking curlers representing the sport, now stand young athletic individuals with more work capacity and sport-specific athleticism than some hockey players! Golf was an old man’s game and now we see how golf has changed the methodology of many other sports training because of the amount of vertebral rotation. Imagine that! A sport that’s changed all other sports in regards to the rotation and how to train it. Needless to say, I was asked the same question by my client that I used to get asked by hockey moms, “can you make Johnny/me faster?” So, let’s talk about speed and agility for agility dog trainers, and see if I can help them out. That’s right, you have to start a program that takes you through phases of training preparing you for your competition season. This means that you need to be able to lift weights for joint, tendon and ligament strength as well as build good muscle density, and no, this does not mean bodybuilding. You have to implement this program with an experienced athletic trainer who screens you first so that he can plan a proper program for you. Part of this program also needs to implement a proper conditioning side as well. You need to build up your work capacity so that you can recover much quicker, which means he needs to assess the energy systems needed for your sport. You need to build a strong core period! And you need to have all this in a program so that you don’t injure yourself in competition or worse yet, prior to competing. An integral part of the training that is overlooked as well as misunderstood within the general population. Usually, this part is a preconceived notion that a few days off from the gym is all that’s needed. Not understanding that the importance of sleep, the preparation to sleep, and the quality of your sleep play a big part. Another type of recovery is through the understanding of breathing through different postural methods that aid in bringing down your heart rate when needed. As well as understanding breathing through tempos, and the efficiency of breathing. And finally different methods of regeneration as an active recovery, such as swimming, massage, and yoga. Recovery is probably the most important factor when it comes to improving your performance, as it also helps with injury prevention; bad recovery equals bad mistakes in movement. What Is a Training Phase or Block? I won’t bore you with the details in this paragraph but suffice it to say we use what’s called periodizations to get you to your goals. This is a systematic approach to putting together a program from start to finish in regards to your offseason until you get to competition season. When in-season we program differently since the stresses on the body could be greater. A basic understanding of the individual via a movement screen usually gets us started in regards to understanding certain movement inefficiencies or possible injuries. After this, we need to discuss your short term goals as well as your long term goals in regards to your sport, time spent training offseason, life-work balance, and when you start competing. A good trainer will have the basic understanding to create, communicate and execute on your very own training periodization. It is this systematic approach that can monitor an athlete to succeed and achieve their goals with injury prevention in mind. That’s right, although I can just put this into the strength and conditioning tip I feel it requires it’s own paragraph. Training the core comes from understanding the individuals movement screen, past injuries, a conditioning test which looks at postural deficiencies under duress, the sports discipline they play, etc. Improve your core strength and you automatically improve your performance in any sport but specifically in change for direction athletes. Specifically, core improves your balance and stability which in turn aids in injury prevention. Your core strength is part of the very primal movement abilities that we all start with and given that the human race has changed we are now seeing worse and worse postures, movement, and core strength. This is why we train the anti-rotation, pillar strength, glute activation, and scapular stability/mobility. Train the core and you’re training the body to be a machine under pressure.